The world must have seemed a tantalizingly big place to John Edward Noble, because he fibbed his way into the military just to start seeing every bit of it he could as soon as possible. The misrepresentation of his actual sixteen years was, however, only one of two lies that made their way onto his induction papers, the other being that the son of Elizabeth O'Rourke of Ireland and John David Noble of Scotland was a German-Italian. Inexplicably, John Noble the younger would spend his entire life telling this lie, though at the time of his birth in 1878, there was nothing particularly to be gained by claiming a heritage of sauerkraut and pesto over one of cabbage and haggis. What sense there was to be made of this curious lie was not made while he was alive; there's no hope to make sense of it now, forty-nine years after his death. Just pieces of him now remain—and not enough to know him well by proxy. Pictures, some newspaper clippings. Facts—a date of birth, a year of death, a wedding anniversary. His favorite joke. It's said that one's favorite joke says something about a person. John Noble's favorite joke was the one about the guy who complains to his buddy that his wife is a terrible housekeeper, just filthy; "I've got to move the dirty dishes every time I want to piss in the sink." A touch of appreciation for the absurd then, it seems. But mostly, there is just enough left of John Noble to draw an outline, with the rest to be filled in by supposition and imagination. He was fiery—that much is sure. And he loved a good fight. It was a terrible habit that would stick with him throughout his life, yielding lost jobs but great stories. 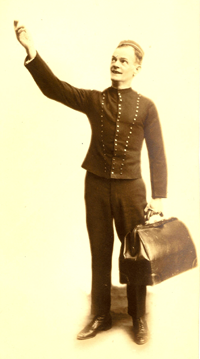 A man of small stature with an outsized need to prove himself, he was dishonorably discharged from the military service he had lied his way into, sometime just around his 20th birthday and the Spanish-American War. In later years, he would draw an imposing man into a fistfight on the bus, because the guy was eating a salami and "blowing his salami breath" at the irascible scrapper. At 19, he married the 16-year-old Elisabeth Rogatz, forming a union that no one thought could possibly last; they were too young; they were foolish. And for more than sixty years, John Noble marked their anniversary by saying, "They were right—it's never going to last. I'm going to divorce her." It was a weirdly wonderful union that lasted until death parted them, just as they had promised each other it would, probably because it was such a perfect, peculiar match. His foul temper was nothing to her; the angrier he would get about something, anything, everything, the more she would laugh, and the more she would laugh, the angrier he'd get. He loved to bake, and once made her two cherry pies, which were still cooling when she came in and said, "Oh. I wanted apple." John Noble picked up the pies and flung them against the wall, sending Elisabeth into gales of laughter as he stormed out and pie slid down the wall. Then again, maybe what made their marriage work was spending much of it separated as John Noble was touring the world. 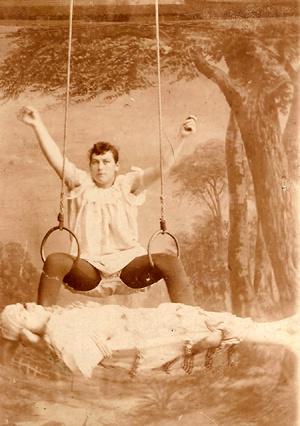 Small but incredibly strong, and flexible, he made a career for himself as an acrobatic contortionist. 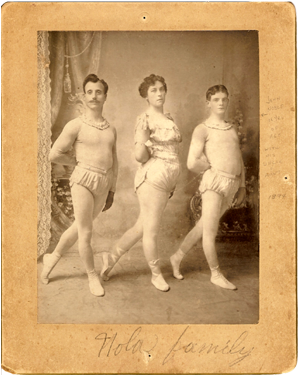 He trained with his aunt and his uncle, known as The Nolas, and for some time, the three of them worked together, ever pictured in the same order, with young John Noble on the right. After his time with The Nolas, which, one imagines, ended with the retirement of his relatives and mentors, he spent the next several years as a part of various acts, though none of them found him any measure of success beyond a living, no small feat itself in those days. 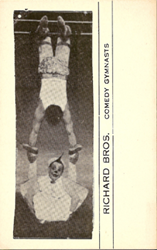 It wasn't until John Noble founded The Richard Brothers: Comedy Gymnasts that he began to make a name for himself, even if it wasn't his name. The other Richard Brother was not his brother, though they shared at least one notable trait in common—not being named Richard. From whence the name was taken is anyone's guess. 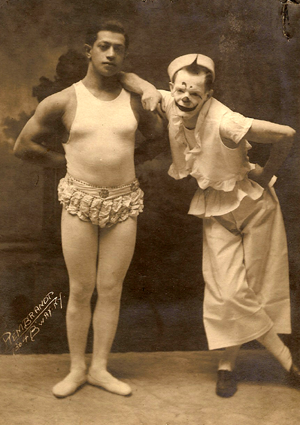 The Richard Brothers toured for many years, traveling all over the world. In one of John Noble's notebooks, he keeps a record of their destinations, and he can be followed from Rockaway Beach to London to Australia and back again, until his penciled notes are suddenly obscured with newspaper clippings—adverts for and reviews of their shows. Over time, the Richard Brothers move from opening act to headliners. The comedy gymnasts could draw a crowd, ladies and gents. And John Noble always came home to Elisabeth. 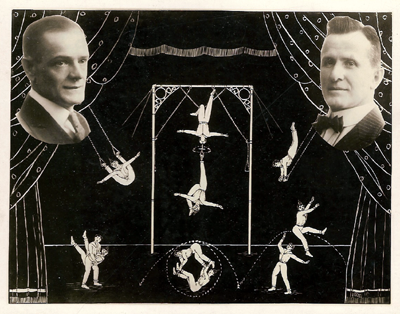 During the years he was a Vaudevillian, they had two daughters—and later, as a complete surprise, a son, born when his sisters were already nearly adults themselves and his father's aging body was soon to end his career as a traveling acrobat. 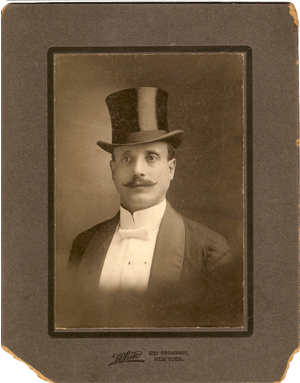 This son was called Gene, and he was my grandfather. One night in 1958, John Noble said to his son, like him an ardent stamp-collector, "Gene, I can't die yet. I've got too much work to do on those stamps." 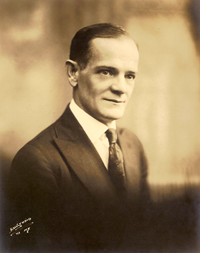 Though John Noble was 80 years old, he was in perfect health, strong in body and mind. Gene said, "You'll live another ten years. What are you talking about?" That night, John Noble died in his sleep. His granddaughter, Mama Shakes, remembers him to me, tells me of his beloved cat Tommy, tells me of the time he hit his head on the edge of a trampoline and came home with his entire head bandaged and one wee eye poking out. Some of these are simply stories she has heard, part of the oral tradition of our family, and I search for myself in them. What part of John Noble has passed to me? I have felt him my whole life in my body, stretchy and bendy and able to contort itself into awkward pretzels. My joints, my tendons, my curving fingers—they are his. Gene could wiggle his ears; I can roll my eyes in opposite directions. 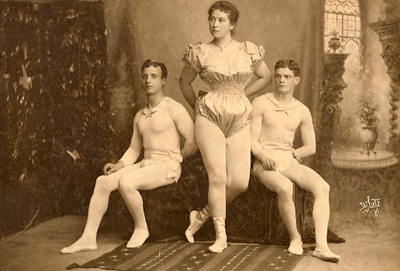 I am short and strong, with muscled legs, like Mama Shakes and Gene—and John Noble, who wanted to see the world. Looking through his things, the remnants of his life, on Easter Sunday, Mama Shakes pulls an ancient, flaking newspaper from a bag, and Iain picks it up gingerly to look at it. "This is a paper from Britain!" he exclaims. It is a copy of The Performer, from May 1914, on the very precipice of World War I, and there is no hint in its pages of the imminent conflict. Iain reads apartment listings for London and Edinburgh. He turns brittle pages gently. 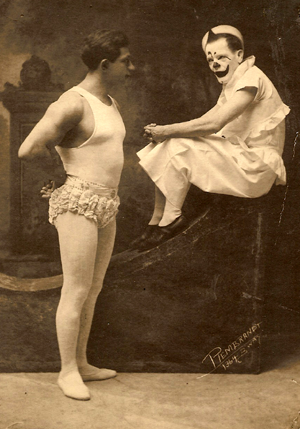 We look at advertisements for the Vaudevillians converging in London from all over the world. "Isn't it amazing," says Iain, "that ninety-three years ago, this paper was brought from Britain, and now here's a Scotsman, reading it in Indiana." As big as the world ever may have felt to John Noble, in that moment, it felt beautifully small to me.